Computer-based ray tracing has been used from the design stage onward to minimize ﬂare and ghosting and enhance contrast in backlit conditions. Ghosting has also been checked at every prototype stage, with its causes identified, assessed, and eliminated. To fulfll the high demands for image quality in still photography, SIGMA has solved a wide range of issues. 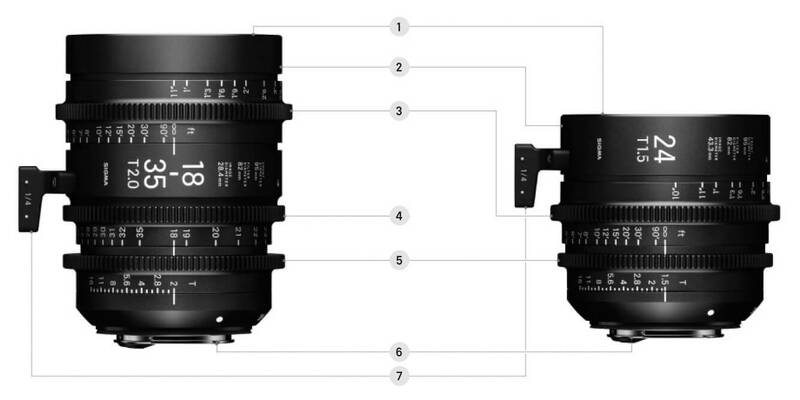 The beneft of these efforts can now be enjoyed in cine lenses as well. The lineup features the same dust-proof and splash-proof construction as the SIGMA 150-600mm F5-6.3 DG OS HSM|Sports. With each ring and mount specially sealed to prevent water and dust from entering, this lens is ready for use in tough conditions. The unusually robust specification of the lineup allows the user to concentrate on shooting while significantly reducing the burden of maintenance. The specifcation, gradation baseline, and lens change indications all feature luminous paint to aid in changing and operating the lens in the dark. The USB DOCK allows the user to connect the lens to a computer and update firmware, while the MOUNT CONVERTER MC-11 allows users to enjoy the high performance of SIGMA’s Canon EF mount interchangeable lenses with the Sony E-mount camera body. These and other accessories further enhance the convenience and ease of use of the new lens lineup. Lenses come complete with a conventional cine-style front lens cap.